Vidya is the glue and the duct tape that holds TNS together. It started as just a few sheets of paper mailed to members in 1978. This mailing was the only practical means for members to exchange thoughts and to communicate in those first decades. Today’s Vidya is a formal journal published six times per year. It often exceeds 50 pages in length and features well written articles, photographs, stories, poems, puzzles and announcements. Content may range from PhD level academic summaries, to high IQ lifestyle. All seem to include interesting and eclectic musings. 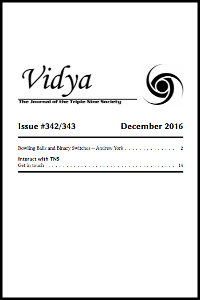 Most members access Vidya online as a PDF. 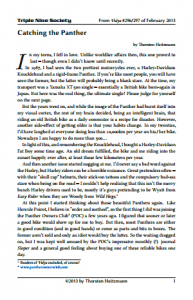 For historical reasons, each bi-monthly publication counts as a double issue with two issue numbers. Vidya in 2015 is well beyond 300 issue numbers. For an extra-cost, you can have a nicely printed version arrive in your mailbox. The extra cost is $20 per year, which about covers the cost of printing and mailing. Vidya content is exclusively provided by members. There are personal stories and experiences, semi-scientific articles, puzzles, pictures, poems, news about the society – and everything in-between. Below are some articles that will hopefully give you an impression of the diversity you can expect in TNS. And they are good reads, too. Just click on the PDFs. 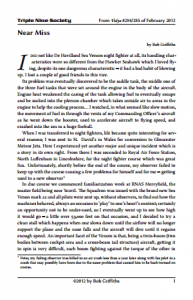 Former RAF pilot Bob Griffiths dislikes the De Havilland Sea Venom. Here's why. Bill Matson, co-author of Data-Driven Investing, on thinking differently when investing money. 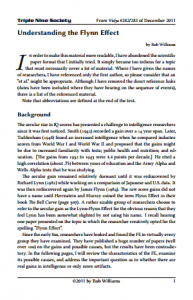 Bob Williams examines the Flynn Effect in detail - this article is a must-read for those who think they know but often don't. 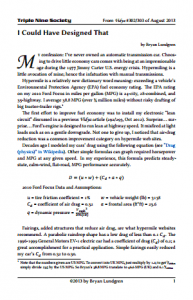 Bryan Lundgren is into hypermiling. Here's his story. 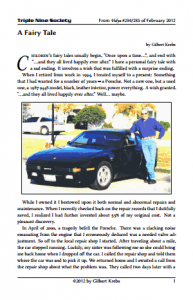 Gill Krebs tells about the joys of selling a Porsche. Some people think they own a perfect motorcycle. Some people know that they own the perfected motorcycle. To join the latter, Thorsten Heitzmann caught a Panther. 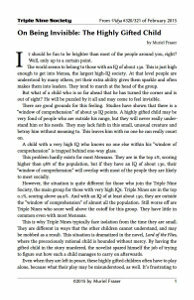 Often, people (and especially children) with a really high IQ are being considered socially awkward. But, as Muriel Fraser describes, what is considered socially awkward is often an expression of not fitting into one's age group or interest group rather than not fitting into a social group at all.